Kartemquin co-founder Jerry Blumenthal (Golub: Late Works Are The Catastrophes, Prisoner Of Her Past) continues his explorations of memory, loss, and artistic expression with Murder The Prepositions, a film about old friend and colleague Les Bridges. Adam and I recently did a three-day shoot with Les Bridges in his new home in Dobbs Ferry, finally picking up on Murder The Prepositions. where Gordon Quinn and I left off 17 years ago. 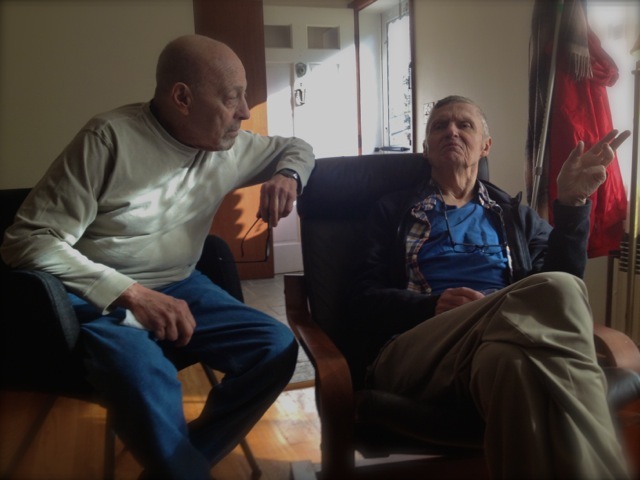 We of course focused on Les’s persistent frustrations with aphasia, now greatly complicated by his struggles with the pains of aging. Nearly two decades after his stroke, Les is still a poet fighting for the right word, often for just a word. Sometimes it’s just “damnit!” But today Les’s strongest feelings come with a touching gratitude for the unexpected rewards he reaps from these constant battles with words. Unmistakeable and in full view is his close relationship with his daughters and grandchildren, which he enjoys even as he bemoans his loss of “power”. Leaning back in his chair, eyes shut tight, Les strains to describe how his wild early days in New York were selfish and denied him his current irreplaceable comforts with family. Here I share the frame with Les, appearing as a friend who in many ways identifies with him, slightly shifting the point of view of the footage from the 90’s. The recent shoot in Dobbs Ferry produced a lot of great new material Adam and I are excited about, not the least of which was some of Les’s halting attempts at writing poetry---now in response to the Boston Marathon bombings. The trip also uncovered rich archival material -family photos, home movies, some of Bridges’ early advertising work, as well as footage of Les reading poetry before his stroke.